A recent decision by the California Court of Appeal, which reverses a trial court’s decision to dismiss the underlying defamation case, beautifully illustrates how trial courts still do not understand the anti-SLAPP statute. It’s unfortunate the plaintiff had to go through an appeal in order to educate this particular judge. The following summary of facts and quotes are taken from the Court of Appeal’s opinion. I apologize for the long post and multiple citations, but I want to have a place where people can be directed for the proper anti-SLAPP considerations and standards. The complaint further alleges that notwithstanding Seidler-Feller’s admissions, “in an effort to vilify and damage [Neuwirth’s] reputation further,” someone named Richard Silverstein published on the Internet a statement which “in effect called [Neuwirth] a liar” and took the position that Neuwirth had, in fact, provoked the attack and that Seidler-Feller’s “original version” was more credible than Neuwirth’s. Later, on May 3, 2007, Silverstein published on the Internet an article in which he referred to Neuwirth as “a ‘Kahanist swine’ thereby accusing [her] of being a member of a terrorist organization” and exposing her to hatred, contempt and ridicule and injuring her in her occupation in violation of Civil Code section 45. “The United States Department of State has issued . . . a list of terrorist organizations which include such organizations as Al-Qaida, the Palestine Liberation Front, and Kahane Chai, among others. To refer to a person as a Kahanist is to brand that person as a terrorist.” Silverstein knew his publication was false, and it constituted libel per se, she said. On May 13, Neuwirth alleged (in her second cause of action), Joel Beinin joined the fray and published on the Internet a statement falsely accusing her of having made a death threat against him. At the same time, Silverstein issued another statement on the Internet reiterating the allegation Neuwirth had made a death threat against Beinin, although Silverstein knew the statement to be false. Accusing her of committing this crime, she alleged, also constituted libel per se under Civil Code section 45. In response to Neuwirth’s complaint, both Silverstein and Beinin filed anti-SLAPP motions. (Code Civ. Proc., § 425.16.) In his motion, Silverstein asserted Neuwirth’s complaint arose from speech in a public forum regarding an issue of public interest as both he and Neuwirth write about the “Middle East conflict—a highly controversial matter of great public importance and political interest.” He attached copies of the statements to his declaration. Because he has chosen to advocate tolerance and peaceful reconciliation, he said, his “work has attracted vitriolic criticism from those who, unlike him, believe that Arabs and Jews should not live together.” For his part, Beinin basically argued that the claim of a death threat was true and protected on a number of grounds. In a 28-page ruling, the trial court granted both special motions to strike and subsequently entered judgment in favor of both Silverstein and Beinin. While the defendants proclaimed their victory, Neuwirth filed her appeal. Analysis for an anti-SLAPP motion. In the Neuwirth case, the trial court properly concluded that the comments alleged to be defamatory were at least arguably protected speech. But “protected speech” does not mean that the speech is immune from prosecution, and that is the distinction that appears to baffle many judges. Defamatory speech is never protected. * “Protected” simply means that it is subject to a higher level of scrutiny. The second part of the analysis still remains. Plaintiff’s claims must be taken as true. The anti-SLAPP system fails when judges cannot make the distinction between the two parts of the analysis and engage in a weighing process. For example, assuming Neuwirth is a public figure, then she would need to show malice in the comments that were made about her. But in noting the obvious, the Court of Appeal stated that said malice could be inferred from the comment “Kahanist swine.” Some courts appear to believe that malice must be shown by some extrinsic evidence of evil intent, when in fact that proof can be taken from the words themselves. If, in turn, there was a dispute over the meaning of that term (defendant claimed it was harmless), then the interpretation offered by plaintiff must be taken as true (who said it amounted to calling someone a terrorist). The standard is akin to that of a motion for summary judgment, where the motion must be denied if there is any material issue of fact. In other words, in determining whether the plaintiff is likely to succeed with the defamation claim, the standard is, “can the plaintiff succeed IF her evidence is believed?”, not “can her evidence overcome that being claimed by defendant?”. 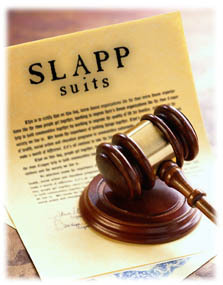 After all, the filing of an anti-SLAPP motion stops the discovery process, so it is to be expected that a plaintiff may have minimal evidence at that point. The complete opinion can be found here. * Defamatory speech is never protected, but that must be kept in context. For example, if Joe Citizen falsely testifies during a trial that the plaintiff cheats on his taxes, Joe can never be prosecuted for defamation for that speech. In that instance there is no defamatory speech that is being protected because the speech by definition is not defamatory. Defamation requires a false, unprivileged statement. Comments made in court are privileged, and hence the statement cannot constitute defamation.